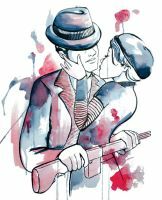 Bonny and Clyde: Dieselpunk Zombie Hunters. Nice, great job. Great ink work on the outlines, nice use of sepia tones and halftone patterns as well to give it that old-timer vibe as well. Can you do it in color?